Between August 8, 1940 and April 23, 1943, the city of Birmingham in England's West Midlands suffered 77 separate bombing raids by the German Luftwaffe. The city endured a total of 365 air raid alerts. The intended targets were the region's indispensable aircraft, transportation, and arms industries. All told, German air attacks destroyed 12,391 homes, 302 factories, 34 churches, halls and cinemas, and more than 200 other buildings. The human cost of the "Birmingham Blitz" (Wikipedia) was a total of 9,000 casualties, of whom 2,241 were killed. This is second only to the damage inflicted on London during the war. 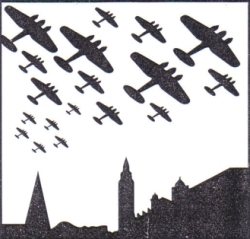 There is an excellent slideshow depicting the aftermath of the attacks on the Birmingham Air Raids Remembrance Association (BARRA) website. The interview was conducted by Robin Dutt at Maddox's home in London, as a part of the National Life Stories collection: Artist's Lives project, and is available through the British Library's Archival Sound Recording service. There is a full transcript of the interview (208 page .pdf), but audio is only available in the U.K., and requires an Athens ID. Maddox had been "reserved" from military service during World War II, as he was working in the engineering and design industry, so I'm not entirely sure what he meant by "dodging the bombs as you fought". In the interview he remembers thinking: 'I don't really want to be in the Army, all this walking the troops that, you know, soldiers do. Flying I didn't believe in, you know, and as for the Navy, well you know, they still had that idea of women and children first. I wasn't in favour of any of these things' (F6321B, page 21). It's easy to see why Maddox and Reed were friends. I wonder what book Reed was sitting on, in the loo?